This is an unusual dog-friendly hotel, in that it’s a luxury spa and a true grand hotel, one of three owned by the National Trust under its ‘Historic House Hotel’ brand. 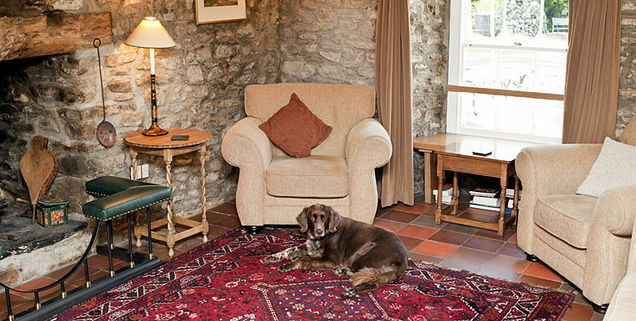 Bodysgallen Hall is a stately 17th century dwelling, dogs are not allowed into the main body of the hotel but there are two lovely cottages where dogs are welcome. Park Cottage is the bigger of the two and recommended if you’re visiting in winter (when the hotel is at its least expensive). The other cottage, Mill Cottage, has a door directly on to the living room and there’s quite a lively draught! Dogs are not allowed in the bedrooms. Both cottages come with small kitchens which are very handy for preparing simple meals and snacks or feeding dogs. They’re also close to the hotel. The extensive grounds of the Hall are great for a dog walk – some parts of the grounds contain sheep, so care is needed. Guests can also sample the delights of the spa, many of which have to be paid for; the swimming pool is free if you’re staying. There are other cottages close to the spa, but I don’t believe these allow dogs. The hotel is also close to Llandudno, which in winter allows dogs on both beaches (after May the North beach and pier are closed to dogs and they must be kept on the lead on the prom. Sadly cyclists do not have to be kept on a lead on the prom, so keep an eye out for them!). The hotel itself provides breakfast and (not cheap) evening meals. In the winter it often does deals, which can lessen the pain to your purse somewhat. For a really special treat, it is worth saving up for. The hotel website can be found at https://www.bodysgallen.com. The Port Light hotel on Bolberry Down is no more… The owners have moved to something far more ambitious, a ‘luxury development’ of holiday homes. It all sounds very nice, and it’s easy to understand the temptation – but obviously it is no longer a dog-friendly hotel! It’s a great shame because it was one of the best. This is a real pleasurable trip down memory lane for me, to a place where we stayed several times when we were investigating mid-Wales. First things first, the good stuff: the Brigand’s is a 15th century coaching inn, and absolutely beautiful both inside and out. Genuinely ancient exposed beams, a lovely cool slate floor for dogs to chill out on and yes, there are areas where your dogs can relax while you eat. The furniture is a quirky mix – there’s a dining room proper where the dogs don’t go, plus pews, sofas and more standard tables elsewhere in this maze of a building where they’re welcome. The rooms were always comfortable – we used to stay in Room 1, which had a rather wonderful four-poster bed (I see from the website at http://www.brigandsinn.com/ that that is still there). This room has an ensuite, which was tastefully finished with decent toiletries. The hotel’s on a roundabout off the A470, so you’d expect some traffic noise but in fact I didn’t find it intrusive. The hotel being so old is a bit creaky, you do hear people moving about occasionally but I never found it overly noisy. We also liked the fact the hotel was in easy striking distance of Machynlleth and Aberdyfi, the Talyllyn railway and other great holiday spots. There’s plenty of walking both in the immediate area and of course at the fantastic mid-Wales beaches. My word of caution here is that the hotel has changed hands since we stayed – it’s had an extensive renovation and from the website the rooms are looking very nice. I had a peek at TripAdvisor though and I can see one or two grumbles there about booking mistakes (though the manager replied to one claiming no booking had been made). I’ve mentioned booking as an issue before (in my blog on the Cricketers Arms). It can be a major irritation, particularly if you’ve set your heart on going somewhere for a special event like a birthday. What I’d advise is to keep paperwork, and take it with you when you go – and phone the hotel to confirm the details a week before your actual trip is due. There’s nothing worse than arriving somewhere and finding no trace of your booking! I have to add that there are also some glowing reviews of the hotel and food – we’ve been back to eat since the change of ownership and found the menu less extensive (it had been mind-bogglingly huge). The food was fine, nevertheless, and the choice was more than sufficient – the chefs are obviously still doing a good job. You can expect local, seasonal produce (decent chips) and a hearty, pretty standard full breakfast. Dogs are still welcome – so with the above caveats in mind I’d say it’s one to give a try. I’d love feedback on this one. Certainly the rooms are priced reasonably. Book well in advance, do some checking, and you should have a good stay. Room 1 is certainly big enough for two people and two large setters! The Grumpygreengranny blog is now dedicated to reviews of dog-friendly hotels, so we welcome any reviews that readers might have that we can add. We’re based in the UK but if others have reviews of hotels from different countries that would be great. It’s not easy to find good, dog-friendly hotels. Various books have sprung up that list hotels which take dogs, but the descriptions are usually short and probably taken from the hotel’s own website. What we’re trying to do here is establish solid reviews from people that have actually taken their dogs to hotels (or B&Bs) and are able to provide a genuine review for others. Some guidelines: Please keep it honest, and provide the sort of details that other dog lovers might find helpful in deciding where to holiday – for example, if the hotel has problems with access or there’s a busy road nearby, whether dogs can stay in the rooms unattended – and also about your stay, for instance what the rooms and the food is like. Photos are also very welcome. We hope in future to be able to pay people for their words but for now, fame will have to be enough! Full credit promised. Sitting high on Bolberry Down outside Salcombe in Devon, the Port Light hotel calls itself ‘the most pet friendly hotel in the UK’ and it’s certainly got a good claim to the title. For example, the hotel has a pet food fridge, dog wash (really) and large trays in all rooms for placing dog bowls in. As far as we could see there were no limits on the number of dogs you could bring – we met someone with four Viszlas. We went a few years ago but the hotel’s still under the same management, so can reasonably be expected to offer the same sort of service. The hotel itself was at one point a golf club and has a feel of that still in the way it looks – square and white – but it makes up for any plainness in its stunning views. To get to the hotel you drive down some of Devon’s classic narrow lanes (beware, those green sides are full of stones). A moderately steep and narrow lane leads to the hotel itself and a breathtaking view over the south coast with the sea glittering in the sunlight. 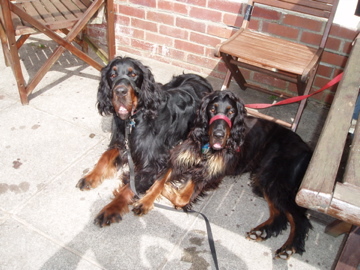 Because the hotel’s so dog-friendly you’ll find plenty of pooches around – it is very popular. You can bring your pets into the bar area, which is where everyone eats (there’s a separate dining room for anyone who doesn’t fancy eating with dogs in attendance, though we never saw it used during our stay). This relaxed attitude to dogs at the table is also handy because you can’t leave them unattended in rooms, which means your other alternative is the car. For a hot summer’s day there are also some outside benches. The hotel grounds lead onto some lovely moorland – wonderful walking territory, though we kept our dogs on their leads because at the edge of the moorland are the cliffs. During our stay we joked that the hotel was really close to the beach, the trouble being that it was 200ft straight down. You can however walk along the cliffs in either direction and gain access to beaches – it’s about three or four miles to Hope Cove in a walk that has some bad moments if you suffer from vertigo, and less in the other direction to a lovely little cove. I would add that these aren’t walks for anyone who doesn’t like the odd scramble. The dogs managed easily though, despite Lexie trying hard to eyeball the sheep (giving me nightmares about being run over the cliff by a posse of panicking ewes). The hotel has two outside bedrooms with their own patio areas – we had one of these and found it very handy and self contained. The room was comfortable and modern, a decent size with a tiled area where you could towel down a damp setter. 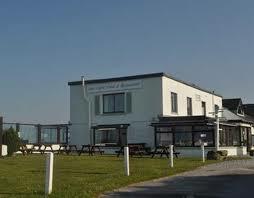 The food isn’t bad, and well priced, home cooked and locally sourced. You’ll find things like curries and lamb shanks, lasagne and seafood pie on the menu, a sample of which can be found on the hotel website here. So, there are plenty of pros. Cons? Well, if you have large dogs you’re going to have to try to get yourself on one of the large tables in the dining area, as the smaller tables at the far end aren’t really suitable as we discovered. A very large and sleepy setter doesn’t fit easily under those small tables, and staff were having to step over bits of him to deliver food – the owner did ask us nicely if we could move him, but there was nowhere to move him to… It’s a conundrum I hope they have solved in the intervening years. It’s a middling-priced hotel, as of now around £100 per room per night B&B depending on the season and the room, add around an extra £40 for dinner bed and breakfast. Pets stay free. The area’s gorgeous – the views from the hotel are extraordinary and you’re not far from the yachting heaven that is Salcombe. Totnes and Dartmouth aren’t far, and there are plenty of beaches – the hotel has a list of those that have dog restrictions and those where dogs are welcome. It’s a lovely area to explore, it helps if you’re fit to get the most out of it and if you have a head for heights you have it made. In our quest to find great, dog-friendly hotels this is one we return to again and again, because it is great in so many ways. 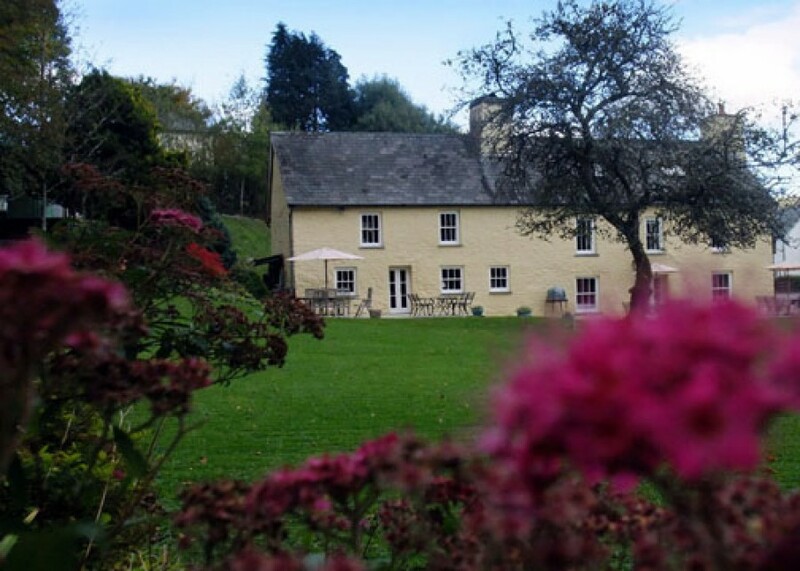 Nestled comfortably in the tiny village of Brechfa, in the secluded Cothi valley, Ty Mawr dates to the 15th century and still has many original features – stone walls, open fires, ancient wooden beams and tiled floors. It’s been very comfortably and carefully restored and has all mod cons. The river Marlais runs past the side of the large and well-kept acre of garden, which is mostly laid to lawn – there are also outside tables for those odd Welsh days when the rain lets up. The hotel is very unusual in that it is dog-friendly but doesn’t take young children, so it’s a very peaceful spot to stay. Annabel and Steve are great hosts, and Annabel makes you welcome with a pot of tea or coffee and a slice of cake on arrival in the cosy sitting room. Service is great, and unobtrusive. We tend to ask for room six, because that has its own front door onto the car park (great for those late night and early morning trips out with the dog). Room five is tucked just inside the hotel entrance and the other rooms are upstairs. It’s not a huge hotel – just those six rooms – so the service feels, and is, very individual. Dogs aren’t allowed into the dining room but Welsh weather being what it is we have never had a problem yet, the weather’s been cool enough that we’ve left ours (and now just Lexie of course) to doze in the car at the end of a happy day out and about. Many people of course will be okay with leaving their dog in their room – we always plan that should the day be so hot that even at 7pm we don’t feel good leaving Lexie in the car we’ll sit outside on the patio. Annabel’s accommodating enough that I can’t imagine it will be a problem. The room we use is very comfortably furnished, with a soft, king-size bed and a corner seating unit, tv and ensuite – a very nice range of toiletries and locally-made soap in various wonderful scents are provided. The food is also absolutely excellent – there’s a varied menu heavily featuring local and organic produce, accompanied by a really good wine list with something for most pockets. You can find a sample menu on the Ty Mawr website, which features typical choices such as organic Fferm Tyllwyd Welsh Black fillet of beef and grilled, line-caught Cardigan Bay sea bass. There’s always a vegetarian option. The breakfasts are also great – there’s a hearty “full Welsh” option, plus others including scrambled eggs and smoked salmon. The Ty Mawr is really handy for the local forest and other attractions– there are plenty of walks, and we often take Lexie on a really great trek through Dinefwr park on the edge of Llandeilo, which is about 20 minutes by car and features both an old castle and an 18th century great house, Newton Hall. The area is handy for both the south coast and Cardigan Bay, and for attractions such as Dylan Thomas’s boathouse at Laugharne, the picturesque towns of New Quay and Tenby, Cardigan itself and (in the other direction) the Brecon Beacons. Downsides? Brechfa can be challenging to find, our sat-nav insists on trying to take us in a dead straight line over a tiny moorland road, which is quite an experience. A good tip if you’re coming from the north is to head for Lampeter before letting the sat-nav take over, from where it tends to take you through Llansawel along a small but reasonable rural road. Coming from the south the easy way in is via the A40; the turn for Brechfa is in Nantgaredig. A car is really a must, though there are some spectacular walks once you’re in the area. It’s a great area for dog walking, and New Quay has an excellent dog-friendly beach (I believe Tenby does too, though they’ve hidden it quite well). This isn’t the cheapest of hotels, so we tend to go for long weekends when we feel we deserve a bit of a break, rather than extended stays. It’s a tribute to how great it is that it’s the one we keep coming back to.